The Stingers hosted the Université du Québec à Montréal (UQAM) Citadins on Thursday night. The Stingers came into the game with some momentum after sweeping a home-and-home series with the Bishop’s Gaiters last weekend. On Thursday night, the Citadins prevailed with a 60-44 victory over the Stingers. Concordia had a horrible shooting game: they only shot 24 per cent from the free throw line and missed 47 shots in total. The Citadins, in recent past, have been the Stingers’ Achilles heel due to their physical play. This was the Stingers fifth straight loss to them. The Citadins started the game scoring the first three points on a basket and free throw by center Jessica Lubin and forward Lorna Desrameaux-Simon. The Stingers ended the quarter going on a 4-0 run on baskets by guard Kaylah Barrett and forward Marilyse Roy-Viau. Yet Concordia still trailed UQAM by the end of the first, down 11-7. Stingers guard Tamara Pinard-Devos hit a jumper to score the first basket of the quarter. The Citadins responded with a basket of their own by guard Janice Quintos. The Stingers went on a 6-0 run however, at the same time, Citadins’ Quintos went beyond the arc and hit back-to-back three-point-shots to erase any progress the Stingers made. Concordia was down 11 points at halftime, 33-22. Quintos was clearly UQAM’s most deadly weapon on the court, scoring 12 points in the second. The Citadins scored the first points of the third quarter on a basket by forward Sarah Cabana. 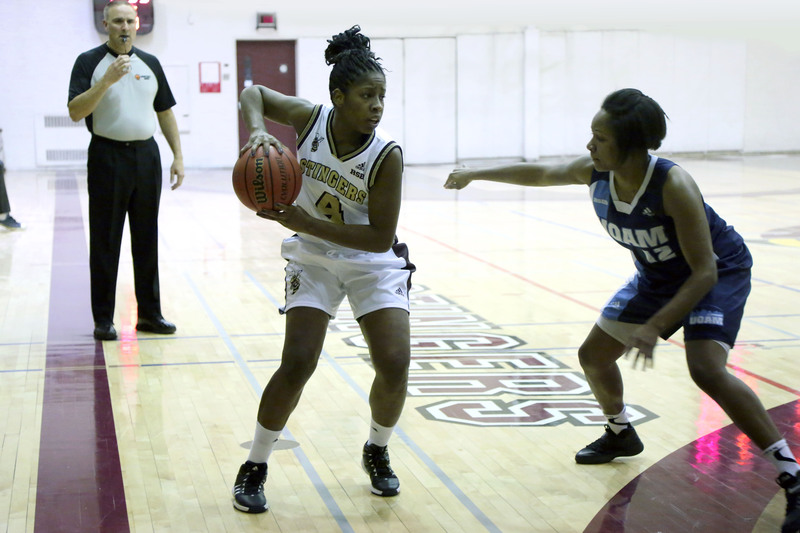 Stingers responded and scored their first points of the quarter on free throws by Roy-Viau. UQAM ended the third quarter on a 6-0 run orchestrated by Desrameaux-Simon who scored all six points. The Citadins led the Stingers by 20 points, 52-32 after three quarters, putting the game out of reach for the home squad. The Stingers tried to make things closer in the final quarter. Stingers Barrett and guard Daphne Thouin both hit free throws to start the fourth. The Citadins only got their first points of the fourth quarter two minutes later on a three-pointer by Célestin. Concordia went on a 6-0 run led by Barrett who scored four points on the run. The Citadins got another three-pointer scored by forward Juliette Delaune which brought the score to 58-40 and secured the victory for the visitors. Stingers head coach Keith Pruden blames the competitiveness of the league for the lack of scoring. “When we played out of conference, we were scoring in the 70’s. And in Quebec, we score in the 40’s and 50’s. The RSEQ is the roughest conference in the country,” Pruden said. Concordia’s best player of the night, Barrett, believed with more players on the bench, it would have been a closer game. “If we had more bodies, we would be able to get some more rest and collect our thoughts instead of making changes on the fly,” Barett said.